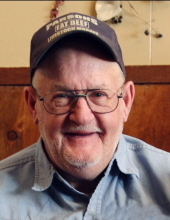 Perry V. Bohrer, 68, of Erie, died at 3:55 P.M., Sunday, February 3, 2019 at the Hospice House in Hutchinson, where he had lived since May. He was born December 22, 1950 at Erie, a son of Asa Wesley and Letha Belle (Yarnell) Bohrer. He was raised at Erie and attended school there, graduating from the Erie High School with the Class of 1969. He served in the United States National Guard and after his discharge worked various jobs before beginning employment with the Neosho County Sheriff’s Office as a correctional officer in the jail. In 2006 he transferred to the county’s road and bridge department and was there until his retirement in 2016. On August 11, 1977 he was united in marriage to Judie Ann Meeker at Miami, Ok. He enjoyed working outside, loved being around horses and his family. Survivors include: two sons – Nathaniel Bohrer, of Middleton, Idaho, Bradley Bohrer, of Erie, KS; three daughters – Elizabeth Seeley, of Hutchinson, KS, Kim Combs, of Hutchinson, KS, Lana Gofourth, of Thayer, KS; eight grandchildren; one brother – Asa Bohrer, Jr. of Erie, KS; two sisters – Darlene Williams, of Markel, TX, Joyce Maloun, of Chanute, KS. He was preceded in death by his parents; wife on August 2, 2003; two sisters – Nancy Louise Bohrer on November 6, 2010 and Loretta Westhoff. Funeral services will be held at 10:30 A.M., Friday, February 8, 2019 at the Pierce-Carson-Wall Funeral Home at Erie with Rev. Mark Demas officiating. Burial will be in the Odense Cemetery. Friends may call at the funeral home at their convenience after 1:00 Thursday afternoon. Memorials are suggested to the American Cancer Society and may be left at or mailed to the funeral home, P.O. Box 182, Erie, KS 66733. Family and friends are invited to join for a potluck lunch after the committal service. Lunch will be held at the Brickhause building in Erie; please bring a side dish to share for the meal. Online condolences may be left at www.walfuneralservices.com. To send flowers or a remembrance gift to the family of Perry V. Bohrer, please visit our Tribute Store. "Email Address" would like to share the life celebration of Perry V. Bohrer. Click on the "link" to go to share a favorite memory or leave a condolence message for the family.